Edited version of tribute given at Helen Lowe’s funeral in June 2011, by Pragna Patel of Southall Black Sisters and Women Against Fundamentalism. More about Helen here. Copyright: © Pragna Patel, 2011. Helen was a presence in WAF and in feminist circles, but a quiet presence. She was always the one in the background who got on with things without fanfare. She oiled the engine and the wheels of WAF. She found time to attend protests, demonstrations and meetings. She was always quick to volunteer, no matter what the situation. She never shied away from difficult issues and always engaged in politics in a principled way. It is hard to believe that Helen is no more. From time to time, I find myself catching my breath. Now there is a silence in my inbox where Helen’s emails would arrive – regular, gentle, persistent reminders of the work that needed to be done and of the struggles out there needing our attention. The last time some of us saw her was on 7 June at a WAF meeting, where she listened with her characteristic attentiveness to Nadje Al-Ali talk about the uprisings for democracy and human rights in the Arab world. We persuaded Helen to go for a drink afterwards and we will forever be grateful for that chance because, in her quiet way, she told us that it was her birthday the next day. We celebrated the moment with an exchange of irreverent jokes and stories. I can still hear Helen’s laughter ringing in my ears. I got to know Helen better especially in the last year. Amongst our many adventures together, I will always remember our visits to Tower Hamlets to support Jasmine Amlai, a young Bangladeshi woman who was being hounded for not adhering to a so-called Muslim female dress code and for marrying outside her community. We were trying to support Jasmine in a tricky situation where members of the Christian right had muscled in to support her and her family for their own motives. I will never forget the twinkle in Helen’s eyes as we laughed at the situation in which we found ourselves – where the Christian right seemed to turn up at every event or struggle that we were involved in. 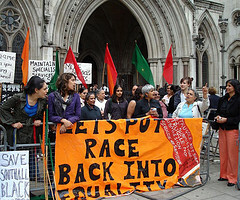 Southall Black Sisters protest outside the Royal Courts of Justice. Photo by Helen Lowe. Helen was also a regular presence at SBS events. It is a testament to her commitment to feminism and anti-racism that, on top of all her other work, she also offered to help SBS with our website. It was Helen who made it possible for SBS to speak at an event organised by disability rights groups in Hammersmith who were fighting off cuts made by their local council. I turned up to speak about SBS’ own struggles against cuts and there she was in the front row, again with that twinkle in her eyes as she smiled with encouragement. SBS will always remember her passionate support for our work, her encouragement and her total dedication to various causes for justice and equality. For me, however, it was her gentleness and generosity of spirit – her essential humanity and immense intelligence that shone through … Helen would have wanted us to … use her memory to continue to fight for justice and peace.